A pull-up bar is one of home fitness’s more convenient and cheapest exercise equipment. It offers you an excellent workout. You will be able to get into excellent shape which requires only your own bodyweight. A chin-up or pull-up bar is usually either wall mounted or is attached to a door frame. When you use a door mounted bar it is specifically twisted into the right place of the door frame. While it is not quite as reliable as a fitted bar, it will hold your weight, while you will not damage the door either. A wall mounted pull-up bar gets attached to a wall with screws. You will need to drill holes and use the correct screws or roll-bolts which usually come with the bar when you purchase it. They have a major advantage though in the fact that they will last a lifetime and are very sturdy. They will be able to carry a lot of weight too. Why do you need a pull-up bar? As far as home equipment and even for gyms, there is no equipment as good as a pull-up bar to work your back muscles. You can do different exercises like pull-ups and chin ups. You perform a chin up by placing your hands on the bar with your palms facing you. When you do a pull up though, your palms are facing forward. In order to work different back muscles, you shorten or widen the gap between your hands, it also works well for bodyweight rowing and you only need to mount it lower. It is not everyone that has the time or the cash to spend on a regular gym membership. Your problems are solved when you get the inexpensive option. You will be able to exercise your chest, arms, lats, traps, shoulder and even abdominal muscles equally well. when you use it regularly or only three times per week for thirty minutes you will keep fit and healthy. An exercise that many bodybuilders and exercise fanatics omit is doing bodyweight exercises. With the vast range of exercise equipment on the market doing all the work for them, they tend to forget the old-fashioned way of exercise. Chin ups and pull ups can leave you with outstanding upper body development. Combine that with a well-rounded cardio and exercise regime and your body will look like a million dollars without a gym membership. The risk of injury is zero and bodyweight exercise has no strain on muscles and joints either. Your advantage is that you can alter the difficulty of your exercises too according to personal fitness level and current strength. As important as it is to have muscle strength, is it important to engage all your muscles in the correct range of motion when you are doing pull-ups. When you find that you struggle to do a pull-up, simply make a small adjustment to your posture and you will find it becomes easier. It isn’t due to strength, it is using the right range of motion. When you do pull ups it increases your strength, but additionally is it excellent for improved posture. It is one of the tops recommended exercises for people that work behind a desk all day and sit in a hunched position. A pull-up bar could help in making your back straight and open your chest while pushing back your shoulders. Throughout the motion are you working the entire upper body, back, chest, shoulders and arms. Training on a pull-up bar is excellent for many reasons and other regimes like training for CrossFit. It builds both strength and endurance. When you lift your body weight, you are achieving the exact results as when you lift weights in a gym. While women are generally lighter in weight the average man can weigh between 75 and 100 kg. If you weigh 80 kg, will you be able to lift 80 kg weights in a gym? Probably not, but with the pull-up bar, you will be able to lift that volume. It is surprising when looking at strong, muscled people that trains often that cannot manage a single pull-up. The reason for this is because they focus on performing pushing exercises like a bench press. These men often neglect their back muscles too. Sturdy and compact are two first factors you look at as you consider the amount of available space you have especially when you want to fit it indoors. You also need to look at the types of fitting or where it is used, from ceiling mounted, to wall mounted or door mounted. Versatility is a major factor when you buy a pull-up bar. 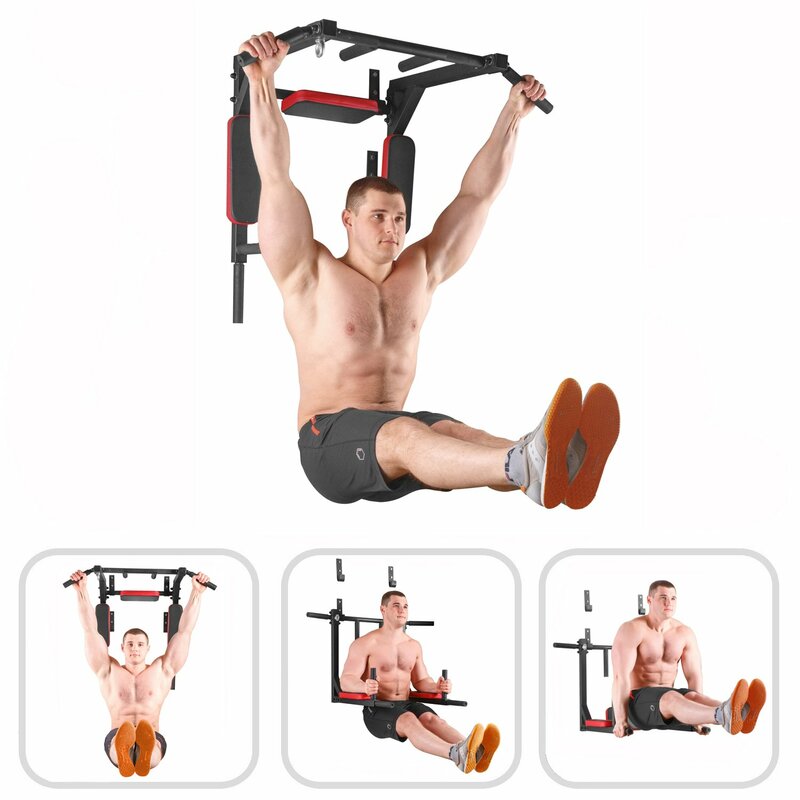 For example, the best of the pull-up bar reviewed here is more of a multi-functional all-over body exercise machine than a pull-up bar. The number of different types of pull-ups, chin-ups and dips make a difference when you do not want to use another machine or anything else except maybe cardio three times a week. 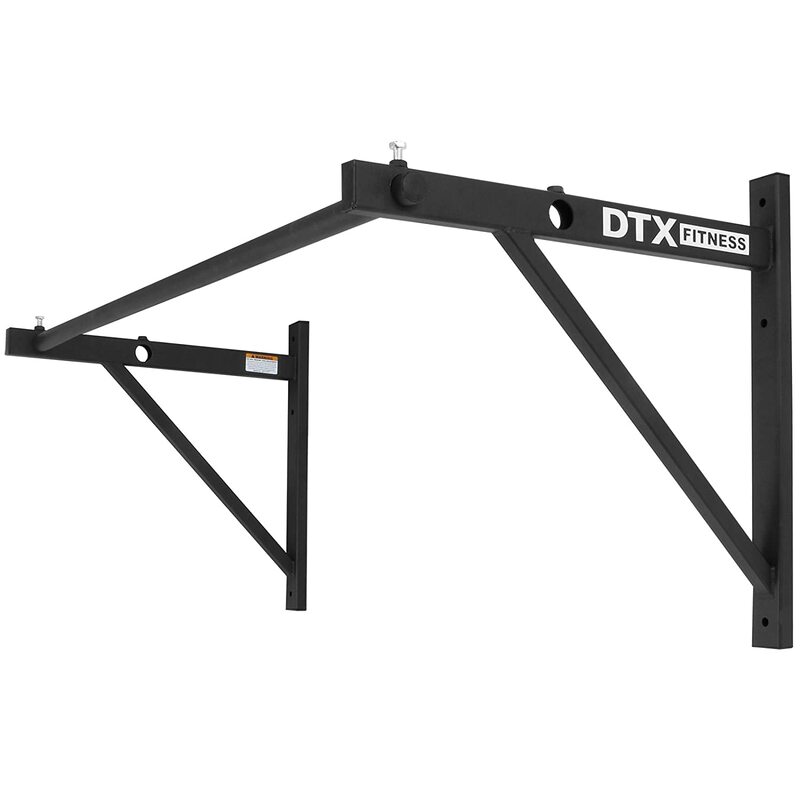 The DTX supports up to 150kg and is wide at 1.33 metres. Its advantage is that it is not too close to the wall at 53.5 cm between wall and bar. It is solid and built to lats and it gives you tow positioning options to fix it closer or further from the wall. When you prefer it closer to the wall the distance will be 33.5 cm instead of 53.5. The DTX is not quite in the class as the two best below, but a good beginner pull-up bar when you are not hassled with a wide range of exercises. It is an excellent quality bar at an excellent price and allows for multiple muscle group exercises. The high gloss finish is attractive and will not be an eyesore inside or outside your home. 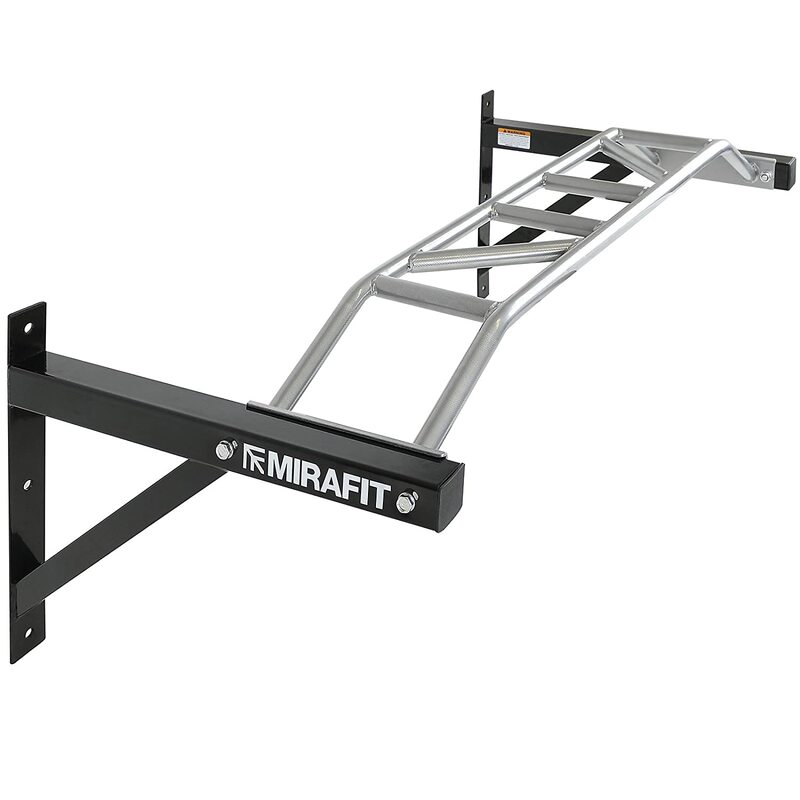 The Bar2fit is the best for many reasons as it is the most versatile on the market. With the bar2fit you have everything from a chin up to a pull up to dip bar. The assortment of exercises makes it an excellent full-body workout machine. It can also be used with TRX straps where you can do triceps extensions, bodyweight rows, single leg squats, hamstring curls, pushups to name a few. The Bar2Fit is a multifunctional fitness machine that is equally good for beginners and advanced athletes. You can do a wide range of exercises making it a full body workout machine and not only a pull-up bar. It allows for dips, pull-ups and when you reverse it also leg raises, hanging leg raises and hanging oblique twists. It utilizes 2mm thick steel, is easy to assemble and rapid mounting against walls.